There have always been secret agendas behind Chishimba Kambwili’s anti-business actions. While interfering in mining companies’ operations in Zambia, Kambwili was controlling a UK-based mining company. While inciting revolt among miners, Kambwili was not paying his workers. While asking for the mining companies to pay their workers full salaries, Kambwili was reducing the salaries of his employees. While accusing mining companies of “illegal activities,” Kambwili was doing business with the mining sector as a contractor. 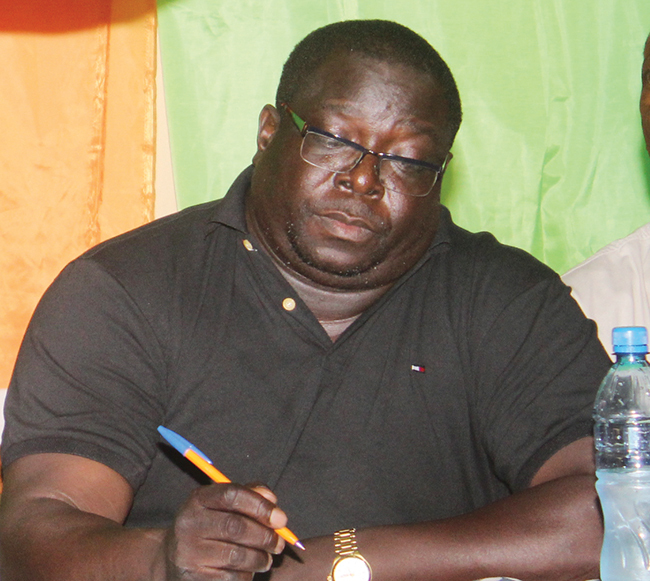 Nowadays, Kambwili delivers documents criticising the potential settlement between ZCCM and FQM to The Mast. And again, there is a secret agenda behind Kambwili’s actions. This time a much bigger agenda: Kambwili is fuelling a major anti-Lungu campaign. In March 2012, the Economist Intelligence Unit (EIU), the research and analysis division of The Economist Group and the world leader in global business intelligence, revised its country risk assessment on Zambia. According to the EIU, “investor confidence is likely to have been boosted by Mr Sata’s decision to take the labour portfolio away from Chishimba Kambwili. Mr. Kambwili is believed to have alarmed investors with his adversarial approach”. The EIU analysis was referring to a series of irresponsible statements, including one accusing investors of treating miners as “slaves,” made by Chishimba Kambwili in his capacity of labour minister. Kambwili’s instigations had boosted unrest across the mining sector with strikes taking place at three major mines – Konkola, Mopani and Kansanshi. President Sata held Kambwili responsible and put an end to his weeks-long career as labour minister. There is another thing Michael Sata might have found out about his labour minister: Chishimba Kambwili had a pecuniary interest in the mining sector. 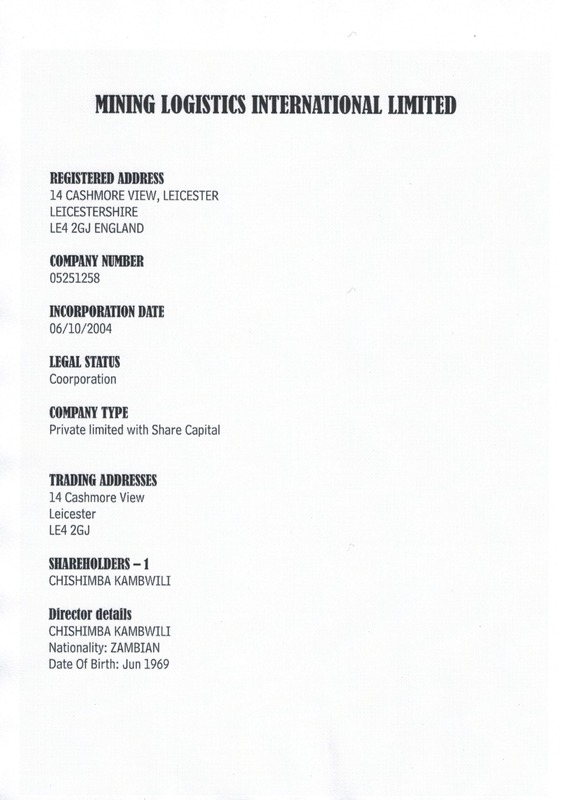 Back in 2004, Kambwili founded his own mining company in the UK, Mining Logistics International Limited. Chishimba Kambwili was the sole shareholder of the Leicester-based company. And, although this information does not appear in any of his official biographies, Kambwili was the director of Mining Logistics International Limited for almost two years, from October 2004 to July 2006. Kambwili has built his entire political career on populist, anti-business rhetoric. In February 2011, then-opposition MP Kambwili interfered in Luanshya Copper Mine (LCM) operations, inciting revolt among the workers. But while publicly condemning the LCM investors, Chishimba Kambwili was secretly doing business with them as a contractor. In 2015, copper price hit a six year low. Also affected by currency falls, Zambia’s mining-based economy was struggling. Chishimba Kambwili made the mining sector a scapegoat. In April 2015, Kambwili said the Zambian government “will not take kindly” First Quantum Mineral-owned copper mine Kansanshi. In October 2015, Kambwili accused mining companies of “illegal activities” and threatened that government will “suspend their operations.” The same month he ordered Luanshya Copper to immediately pay their workers full salaries. In December 2015, Kambwili announced that he will not allow any job losses at Chibuluma Mines in Kalulushi. It was the same Chishimba Kambwili who was in a legal conflict with his own employees after reducing their salaries by 35 percent and later terminating their employment without notice. As revealed by OSI, Chishimba Kambwili is currently fuelling a media campaign against an out-of-court settlement in the case opposing the state owned Zambian Consolidated Copper Mines – Investment Holdings (ZCCM-IH) to the country’s biggest copper producer First Quantum Minerals (FQM). (http://www.opensourceinvestigations.com/) Once again, Kambwili’s anti-business action is only a pretext. But this time what is at stake is much bigger than Kambwili’s effort to hide his mining company, his businesses with Zambia mining sector, or the humiliating manner in which he treats his workers. This time the real target is President Edgar Lungu himself. The ZCCM-FQM controversy is a part of a plan to install a new leader of the ruling Patriotic Front and block Lungu’s candidacy for the 2021 presidential election.